It’s turned into a bit of a dramatic week in our house. 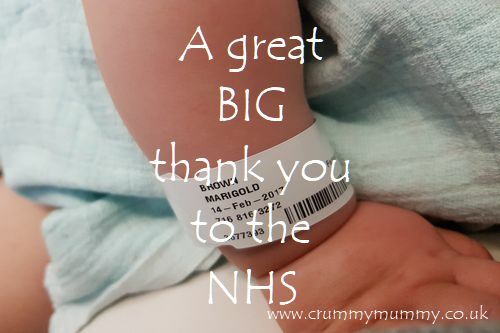 And we owe the NHS one great BIG thank you. 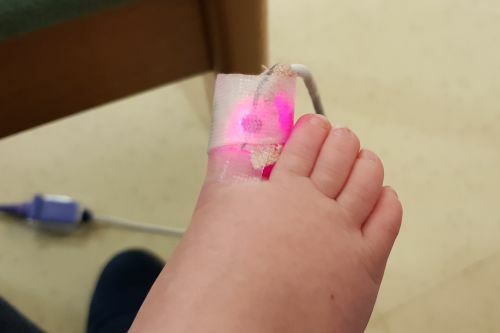 The thing about the NHS is you tend to need it when you least expect it – in our case when what appeared to be nothing but a mild cold suddenly had Littlest B struggling to breathe. It was early evening and with our GP surgery closed we took her straight to A&E, chest heaving and little heart racing. It’s fair to say the NHS gets some pretty bad press and while it’s true not everything works as it should (as a type 1 diabetic Misery Guts is often victim of budget cuts, miscommunication and the one-size-fits all system, and some of my miscarriage care was less than ideal) but there’s a lot that actually does work. Thank you to the nurse who took one look at us at the doors of the children’s emergency department and whisked us straight through to a team of doctors. Thank you to the team of doctors who diagnosed a chest infection within minutes and were treating my baby before I even had time to draw breath. 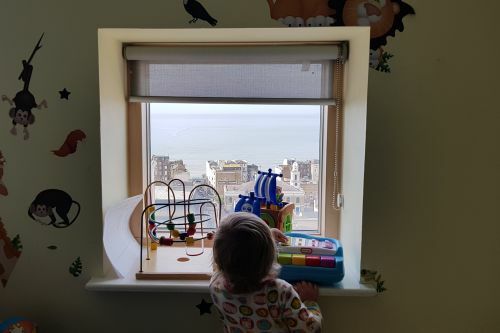 Thank you for the medicine which did it’s stuff and helped her turn a corner as quickly as it had taken her to go downhill – and the pull down bed next to her cot, so we could sleep side by side and I could put my hands through the rungs to soothe her. 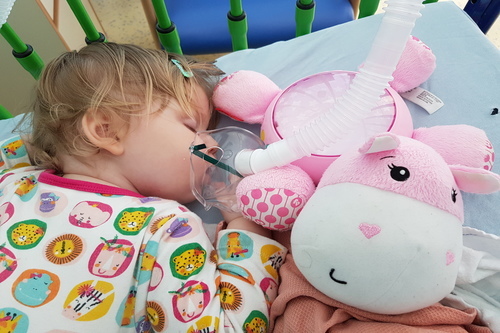 Thank you to the nurse who could see there was no way she was going to wear her oxygen mask, and thought to fix it to her hippo soother next to her sleeping face instead. Thank you for thoughtful touches like windows to the outside world and glass in doors at little people height instead of big people height. Thank you to the League of Friends for providing more toys than you’d find in a toy shop. And a big thank you to the lady from Theodora Children’s Charity who had goggly eyes in her bun and squeaks in her shoes and made Littlest B laugh for the first time since we arrived. Oh, and a shout out to the nurse who gave me a wifi code she shouldn’t have given me so I could write this post. Far from an NHS in crisis we found an NHS doing exactly what it was set up to do: there at the point of need providing free healthcare to those who need it. 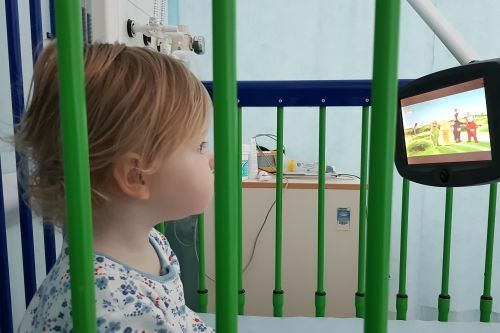 As I write Littlest B isn’t well enough to come home yet, but she is responding to treatment with CBeebies streamed to her cot via her own private TV, all thanks to our NHS. *UPDATE* We were discharged from hospital early the following morning (full of admiration for the NHS). Have you experienced NHS care recently? Did your carers turn out to be unsung heroes like ours? I’d love to hear about your experience! Glad Littlest B is well. I myself have received great carers from the NHS when I had gallstones problem just a few weeks postpartum. We are quite lucky to have this kind of medical benefit compared to other countries. It’s always lovely to see people take time to praise the NHS when it’s all to easy to only shout about the negatives that come all too often with under pay and overwork. I have to say, aside from my GP with whom I can never get an appointment, I’m team NHS all the way. Those people are the unsung heroes of our nation, and I’ve never had anything but total admiration for them when in their care. Aaahh bless you all, what a worrying time. So glad it turned out ok and you had such good care. The NHS are amazing! It’s so nice to read a positive story about the NHS. So glad little miss is on the mend.